Francine du Plessix Gray, who died on January 13, 2019 at the age of 88, was a writer of both fiction and non-fiction, and frequent contributor to the New Yorker Magazine. Born in Poland, the daughter of a French diplomat and Russian émigré from the revolution, she was raised in Paris and came, with her mother, to the United States after the Germans took France. 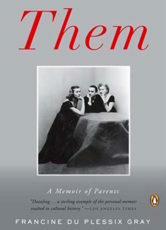 Her most notable book, “Them,” is the story of her parents’ lives, and Richard had a chance to speak with Francine du Plessix Gray about that book and about her career, recorded at KPFA on May 22, 2005. Francine du Plessix Gray wrote one more book after the interview, a biography, of Madame Germain de Stall, a novelist and travel writer who lived during the French Revolution and the Napoleonic Era. Them won the National Book Critics Circle Award for Memoir in 2005.